Man, 20s, trapped in van he was driving and found dead; MDA teams forced to declare death. 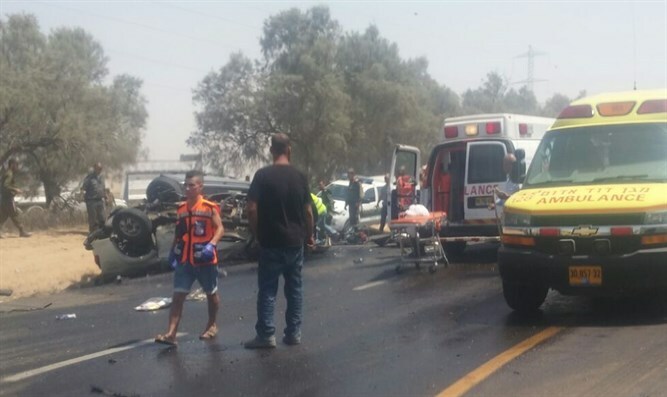 A young man in his twenties was killed and two people were injured in a road accident between a van and a bus that occurred Monday afternoon on Route 232 near the entrance to Eshkol Regional Council. The victim, a young man of about 20, was trapped in the van he was driving and found dead. MDA teams were forced to declare his death within a short time of accessing him. MDA teams assisted by the IDF medical force treated the wounded. The bus driver, a 25-year-old man, was moderately wounded and was evacuated by ambulance to Soroka Hospital in Be'er Sheva. A 30-year-old man travelling in the bus was lightly injured and evacuated to Soroka Hospital in an MDA ambulance. MDA Paramedic Dani Starkman said: "When we arrived at the scene, we saw a commercial vehicle overturned on its roof. In the driver's seat a young man in his 20s was trapped. He suffered severe systemic damage and had no pulse or breathing. After he was removed from the vehicle, we performed medical examinations. He was without vital signs and after a short time we had to declare his death. "The driver of the bus and a passenger were treated with the help of an IDF medical force and evacuated to Soroka Hospital while their condition was medium and light," Starkman added.